ITP is proud to introduce its most rugged tire ever, the all-new BajaCross. This tire is Baja proven to handle the toughest and heaviest UTV applications, and it performs impressively on 4x4 and utility ATVs as well. An 8-ply rating and 25% stronger construction has resulted in a high level of durability. ITP's extended-life rubber compound and innovative overlapping tread pattern provides a smooth, predictable ride as well as slow wear characteristics this is the highest-mileage tire ITP has ever produced! Stepped lugs provide consistent tread edges as the tire wears, for predictable performance throughout the long life of the tire. Wrap around lugs provide improved shoulder protection, while a super deep Rim Guard feature offers the best wheel lip protection in the business. Despite its strength, the BajaCrosss advanced carcass design delivers the most comfortable, trail-compliant ride available. 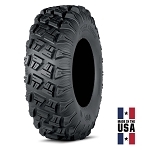 - ITP Bajacross ATV tires are sold individually. 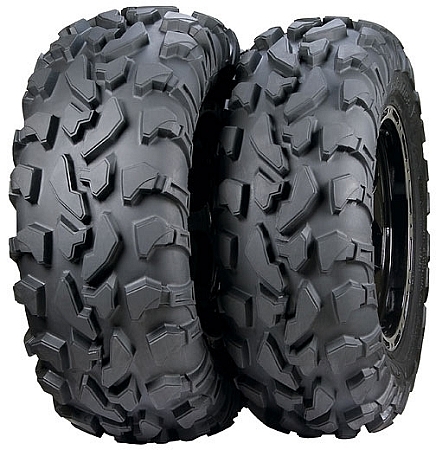 - Our ITP Bajacross ATV tires generally ship out within 1 business day. These tires look like they will perform as expected, but the real reason for the review is to commend Pure ATV staff on excellent service. I was suppose to get my order in two days for a trip I was going on and due to a warehouse problem my order didn't ship. When I called to talk to someone about the problem the office was closed but there was a number to text, so I did. I got a response within an hour and the fixed the problem and sen my tires and wheels overnight so I could have them for my trip. The have earned my business for as long as I need off road parts! Let me start by saying pureoff road has an incredible service department. I had ordered a set of tires and rims 1 1/2 mouths earlier, but after thinking about it, decided they were not the right tires and rims for me. They were fine with me reaturning the unused rims and tires. THANKS. These tires are perfect for what i wonted. Smooth and long wearing on asphalt. Great traction thru rocks and gravel. Fantastic control on high speed trails. Great rim protection. Good side hill grip. And very durable thur shape rocks. I don't even think about getting a flat tire. These are perfect for my 900 Rzr. Recently replaced my OEM Dunlop tires with a set of Bajacross tires. What a difference. Much more traction on the trails, great on gravel and hard pack, OK in the mud. Would recommend these tires for anyone riding trails. Our Arctic Cat Prowler came with Goodyear Rawhides. 260 miles before they were worn down and not repairable. Switched to the ITP Terracross, 1699 miles before rear tires developed splits parallel to rim and wouldn't seal. Terracross still on the fronts. Switched to the Bajacross because of more plies, rim protection & lower cost. Looking for even more miles from these. We run over a lot of rocks and sagebrush in land survey work.